Every Grand trip we’ve been on, someone has either had access to a machine shop or had a friend who had access to a machine shop and used that connection to build a firepan. Most folks don’t have access to a machine shop, so we decided to work with our friends over at Colorado Kayak Supply to build and distribute a CampingByKayak.com firepan for your average non-machinist kayaker. Currently, we have one design in the works that will be meet the NPS Grand Canyon specifications which seem to be the most stringent, but we’re open to building other models. 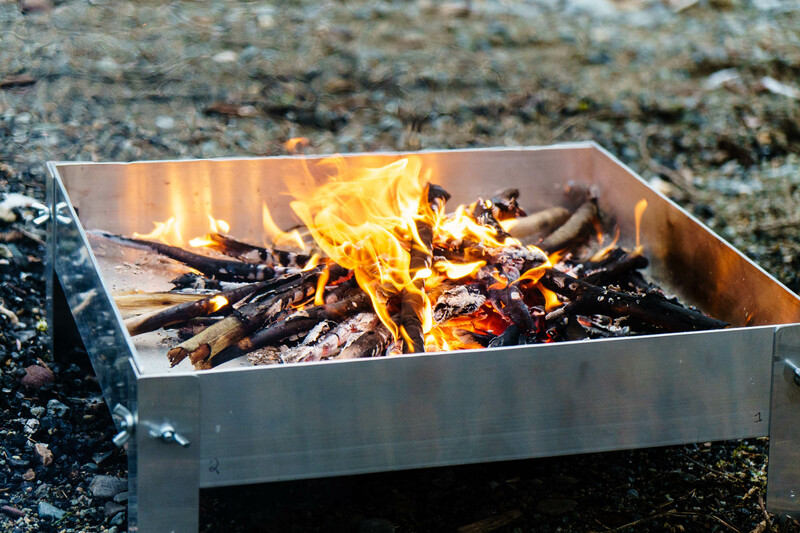 The CampingByKayak.com firepan is similar to the original design, but with a few tips and tricks (like rounded corners on parts) that we’ve learned along the way. We’re currently hammering out the kinks, but if you’d like to be one of the first people to purchase one, please fill out this form to pre-order (no $$ required). We are making them in the USA in limited batches so it’s important that you express your interest if you’d like to buy one. We’re hoping to be shipping them in time for summer 2018 paddling trips. We’d love to hear about any other ideas you might have for self-support related equipment! Send us an email at nick@campingbykayak.com.